But I forgive these foibles for what the movie does so well. It’s simply beautiful. Breathtaking. Stunning. Especially if you see it in 3-D. (Don’t even consider anything else.) The natural world of the movie is a cornucopia of delights painted in lush greens, pinks, blues, and golds. Someone—lots of someones—had fun designing it. I loved the magical effects dancing in 3-D just over the heads of the people in front of me. I adored leaping through the forest and flying through the air on the backs of winged creatures—movement as joyous for viewers as for the paraplegic main character. The buzz is that Cameron’s technical creativity will change movie making forever. And I have to hand him this too: like it or not, the movie tells a true and all-too-familiar story—of one people seizing and destroying the homeland of another for the sake of natural resources. In the film this precious commodity is “unobtainium” (love the joke). Think land, water, gold, uranium, oil—all this in the last 160 years of American history alone. I can put up with a little moralizing—almost unavoidable with a dualistic premise—when the tale that’s told is true. 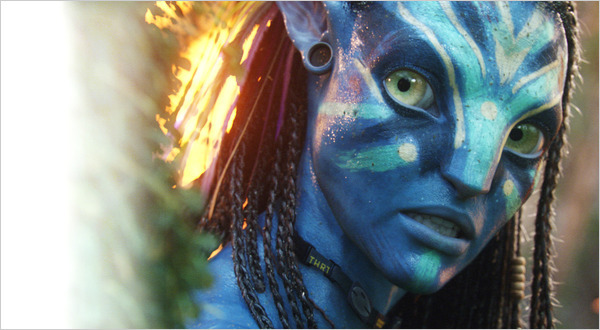 Caleb Stegall at Front Porch Republic countered with some reasons for admiring the culture of the Na’vi, the indigenous people of the movie. He focused on the values of community: a sense of belonging, being part of a people and a place. Only those who are attached to place can become dispossessed, and he finds a collective dispossession happening now; “people know intuitively that they are losing something invaluable.” The Dispossessed-R-Us—where “us” has come to include people of the mainstream culture, no longer only those pushed to the margins. “Powerful outside forces” now threaten everyone’s connection to land, food, and culture. If viewers identify with the Na’vi, I think it’s just as likely that we recognize ourselves as their nemeses—maybe not the cardboard military commander, but what about the corporate workers who were just doing their jobs? White people know full well which side of the Indian wars we fought on. And those of us in the developed world know what our energy-guzzling ways are costing people elsewhere. We don’t want to think that forests are being leveled or coastal people forced from their homes for our sakes. Displacers-R-Us too. Now that’s a scary story. Douthat sounds here less like the Catholic he is and more like an iconoclastic Protestant, ready to banish God from the world except for a few preapproved events. Roman Catholics, with more than a thousand years of robust natural theology, have always found it easier to contact God in matter, starting with bread and wine. Hyperseparation between God and the world has never sat comfortably in Catholicism. This is what modern people, impoverished by a mechanistic view of nature, now crave. A world of relationships. Connections to nature, to the earth—this is the real dispossession that has occurred in the last few hundred years. The human separation from nature is what pantheist and animist traditions throughout the world have tried to heal. It’s why nature religion is the fastest-growing religious impulse in the world today. In our ecologically broken world, maybe it’s time to bring God a little closer to earth. Maybe it’s time to get personal with nature. Thanks to Chas Clifton for starting my train of thought on the movie. All that the so called conservatives have done in their entirely predictable group-think reaction to this film is how barbaric they are. I liked the film because it touched upon the themes to be found in these references–written by a real Avatar too.